Apr 22, 2013 | This post may contain affiliate links. Learn more. While entrepreneurs often jump from business school or the corporate world to start a new business, others take a different path. This is the improbable story of two development professionals trying to change the world through men’s clothing: Introducing J&C Suiting, Georgetown’s new stealth tailors of affordable custom menswear. Last fall, roundabout the same time that Modern Fellows launched, I stumbled across J&C Suiting’s twitter account (“Normal guys in badass suits tryin’ to make the world a better place, one custom suit at a time”). I couldn’t find a website, so corresponded over Twitter, and then email, with founders Colby Kirk and John Hancock. J&C Suiting’s story involves Pakistan, the Peace Corps, Georgetown’s School of Foreign Service and an evolution in thinking about what it means to be involved in international development work. That story isn’t well-known, as they continue to operate under the radar, suiting up guys in the Georgetown community and soft-selling their brand on Facebook and Twitter. While a minimalist J&C Suiting website is now live, they are cultivating a understated, personal and stealthy approach that is likely to continue. At an introductory price of around $400, their suits — “hand stitched by British-trained tailors in Pakistan” under the supervision of their third business partner Abbas — should attract attention. To follow is a lightly-edited transcript of a conversation with Colby and John over lunch at Little Viet Garden in Georgetown. How did two international development professionals come to decide to start a tailored clothing company? [Colby] I started out in the Peace Corps doing development work in Costa Rica. I loved it, but was somewhat jaded with the inability to ensure long term results and thought there was a way to do more from the private sector. I came to [Georgetown’s School of Foreign Service] to get a better understanding of the economic impacts of businesses operating in the developing world. Completely coincidentally, John and I both interned in the Office of Textiles and Apparel at [the Office of the United States Trade Representative] last summer. We’d sit around and complain about the suits we had. There were problems with the tailoring, the fit and the feeling of being part of the herd in a typical men’s store. It was a disaster. At that point, we said let’s go for it. What was your launch strategy? Neither of us had ever started a company before. The nitty-gritty of opening a business and dealing with importing and exporting has been a learning process. We started by selling suits to our friends at [Georgetown’s] MSFS program. People were skeptical at first. Suits from Pakistan sounds a little sketchy and, as grad students with backgrounds in international development, we didn’t really wear them a lot. So we started off locally with the people we knew and convinced a few friends to take a leap of faith. When they received their suits, they loved them and started talking us up to their friends. From there, we started hosting happy hours so that friends could invite their friends and get to know us. In six weeks we went from nothing to having a client base that included Georgetown students, alumni and friends of friends. We suited up our first groom in November 2012 and have done multiple weddings since. Early on we knew we wanted really high-quality fabrics, so we gathered up all the cash we had and made a large purchase of Superfine Italian wools from a distributor in Biella [Italy]. How does J&C Suiting operate? Where is the manufacturing done? The front end is just the two of us. Advertising, social media, developing a website, sales, data, logistics is all us. Both of us made extended trips to Islamabad to work directly with our tailors who taught us to take measurements ourselves. The two of us literally practiced on each other. Over the course of several weeks, prior to our first client, we would have these practice measurement sessions, measuring each other for hours until will we could get that consistency and confidence down. [John] On the back end, we turn it over to our partner Abbas [Tariq] in Pakistan. Abbas came on full-time as of the beginning of 2013 and he manages our order system and the tailors. Together we’vebeen able to build a system to move client orders through the tailoring process with a high level of attention to detail. Abbas is responsible for ensuring client suits are stitched according to J&C standards, as well as the logistics of returning the finished garments to the United States. Our team in Pakistan is really proud of their work. They’re not about quantity, they’re about quality and staying true to the legacy of the fine British tailoring. Our tailors are not going to make a bad suit because it just wouldn’t feel right to them. What is your strategy for scaling up the business beyond friends and colleagues at Georgetown? We like that we are growing by word of mouth. We aren’t salesmen and would rather our clients come to us through referrals or after seeing a friend looking sharp in a J&C. Last year, we had an event at [Georgetown’s] business school and we are looking to hold a couple more events in early 2013 within the Georgetown community. From there, we’ll move into the rest of DC, and in particular reach out to other campuses in the area. There are also some basics that we haven’t taken care of yet. Developing a great website is obviously an important next step. In terms of expanding our team, we haven’t taken anyone else on yet, but we are likely to soon. We need some help with publicity for sure. We would also like to hire a DC based fit specialist to work directly with clients. We would want that person to be able to go over to Pakistan and meet Abbas and learn our operations. When I think about what we’re going to have to do to scale this thing up, we’re going to have to let go of some of the things like measuring people. Having built every aspect of the business ourselves gives us the confidence to let go of some control later on. At this stage we are taking stock of what we just did over the past six months, and translating that into process improvements and identifying priorities for this year. The options for affordable custom suits have exploded in the past three years in Washington and online. How do you stand out in what has become a crowded marketplace? We took a look around at our competitors and we thought, we can do better. We’re aware of the need to develop our own niche. Our focus is really on establishing a personal connection with our clients. We want our clients to know our story, know where our fabric comes from and where we stitch our suits. We’re trying to get guys to see that buying a suit can actually be a fun experience. We are different from online custom suiting firms that promise to deliver a quick and convenient product without the need to deal with real people. We are the guys down the street you’d want to have a beer with. We have a permanent presence in DC and visit every client in person to measure them. When the suit is ready, we come back to deliver the finished product in person so we can evaluate the fit firsthand. If its not right, we make it right. There is also a unique development aspect to our business. We both saw in developing countries that small businesses are one of the most potent vehicles for lifting people out of poverty. We both worked in development, we understand it and are passionate about it. I love it when I get a chance to take out pictures and show clients shots of Pakistan and the Pakistanis we work with. This all helps to build a connection between the client, the business and the country we are passionate about. How are your suits constructed, and what differentiates them from the crowd? The key with our suits is that we do a lot more hand stitching than most of the other guys out there. From the buttonholes to the lining, the majority of the garment is hand-stitched, because that’s the tradition in Pakistan that stems from British influence. It’s a trip being in the tailoring shop in Pakistan. There is this palpable old-school, British legacy. They’re using these old school steam irons from the post World War Two era. 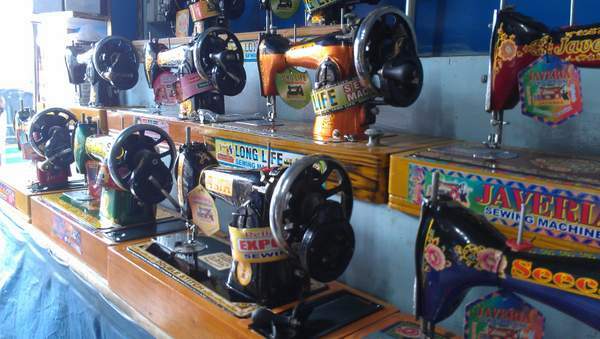 The most high-tech they get is using simple sewing machines. Regarding jacket construction, we find among clients and tailors a lack of clarity about exactly what constitutes a full canvass. To avoid that, we just tell our clients exactly what we do – that we have a floating canvass layer from shoulder to second button hole hand-stitched over a natural hair fusing layer. We can show our clients an open jacket to examine the internal construction themselves. Between our service and the quality of the construction of the suit, we think we’re doing something that really isn’t being done now for [an introductory price of] around $400. Beyond the immediate challenges that you’re wrestling with, where would you like to take the business down the road? One of the ideas we tossed around is that we’d consider trying to place a portion of our stitching operations to Haiti. From where we were sitting over at USTR, it’s a perfect time to get into Haiti. With the new industrial park in Caracol, favorable U.S. trade preferences, and Haiti’s strong legacy of tailoring, it’s definitely an option. John has also lived in Haiti for a year, and there is a large Pakistani community there, so we believe we can pull together a lot of pieces. The idea of re-energizing the garment trade that used to fuel the Haitian economy is really attractive for us. We want to take baby steps but first we have to perfect the supply chain and logistics for what we’re doing right now in Pakistan. Hello and this is Ayaz ul Haq from COTTON & COTTON. Do have a look at our website too and if you ever wish to find a partner in Pakistan for quality custom made shirts then do let me know. Pakistan, eh? Very cool story! Sounds like these guys know what they’re doing when it comes to fabric and construction. Hopefully they get some solid fit experts on board as they expand!